Richard Gilligan holds an MFA in fine art photography from the University of Ulster, Belfast and a BA honours degree in documentary photography from the University of Wales, Newport. His work has been published and exhibited worldwide with recent exhibitions in Berlin, Malmo and Los Angeles. Gilligan has worked as a contributing photographer to a wide range of skate magazines such as SLAP, Sidewalk, Kingpin and Transworld Skateboarding. He was featured in the documentary film/book Format Perspective by Phil Evans released in 2011. Earlier 2012 he was invited to present his work at OFFSET creative festival alongside the likes of Shepard Fairey, Stefan Sagmeister and Evan Hecox. Gilliganhas been documenting homemade skateparks worldwide from 2008 – 2012. This is his first book. Since their first publication East of the Adriatic, released in 2010 in collaboration with Carhartt, Stephane Rançon and Jad Hussein published a few others books on different subjects, all connected with the expression of youth and underground culture, keeping a dynamic point of view. With DIY, they are back to their passion for skateboarding and photography. 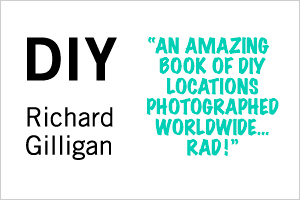 For more information about DIY - A book of photographs by Richard Gilligan click the button below!